Donald Glover's surprise movie/music video/performance art piece/god knows what will be free to stream this afternoon ahead of his Coachella headliner this weekend. But there's a catch - Guava Island is only free to watch on Amazon Prime Video from 5pm AEST today until 11am AEST Sunday. That's only an 18-hour window if we did our maths correctly. After that, it will be available only to paid subscribers of Amazon Prime Video or Twitch subscribers. Guava Island was filmed secretly over four weeks in Cuba and stars Glover, also known by his rapper moniker Childish Gambino, as a singer named Deni who tries to mount a music festival on the island. A shifty figure named Red (Nonso Anozie from Game of Thrones) tries to stop Deni's soulful endeavour to keep the island denizens hard at work. Rihanna has a role as Deni's girlfriend while Black Panther star Letitia Wright features in a small role. 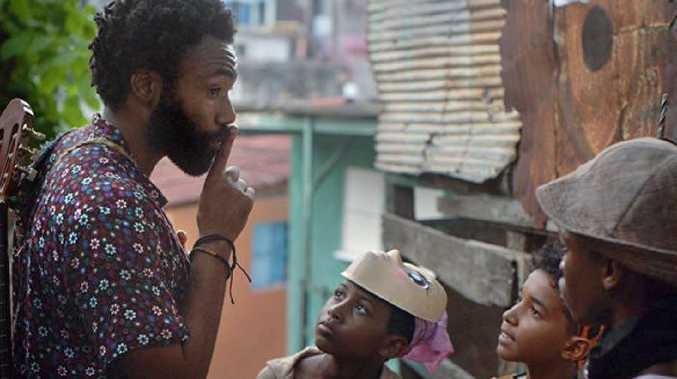 Guava Island is only 54-minutes long and has been directed by frequent Glover collaborator Hiro Murai, who's directed many episodes of Glover's pioneering TV series Atlanta. Glover's brother Stephen Glover is the screenwriter for Guava Island. Guava Island has been kept under wraps since word of its existence first leaked out some months back - not easy to do when a star as big as Rihanna is involved. Don't expect Guava Island to be a conventional movie (not that Glover does anything conventionally), think of it as a showcase for his music and screen talents melded into one glorious package. Guava Island features remixes of some of Glover's most recent music hits including Summertime Magic and Saturday. Glover said it was one of his favourite projects he's ever worked on. Officially, Guava Island is being marketed as an expansion of Glover's "idea of freedom". The creative powerhouse hijacked the Zeitgeist last year with his jaw-dropping video clip for This is America, which Murai also directed.